This is much more fun than the prom was! A little over a year ago, we challenged the BHS Class of ’72 to lead the way with donations to the Stone Bank restoration project. And we challenged other BHS classes to match our effort. What fun it has been to reconnect with classmates and take a few of them on a tour of the building! Most important, we have received some donations to continue work on the building. But we haven’t heard from many of our classmates. In some cases, we haven’t been able to find their current addresses, email or phone numbers. If you have a sibling or friend from our class, please tell them we would love to hear from them — or send us a tip or contact info to touchstones.inc@gmail.com. In 2022, our class will celebrate its 50th reunion, and we would love to celebrate our class’s leadership in putting this historic building back together again. Let’s do this. And we challenge other classes to meet or exceed our class’s gifts to the project, which so far stands at $1,300. This is the architect’s rendering of what the building will look like when we put it back together again. We took down 20 feet of the building to put a foundation under it, and added an extra 9 feet to make room for a rear entry with a handicap lift (left third of drawing). We only need to raise $60,000 to enclose the back section and get the roof on. With your help, we can get this done. Send a check today to: Touchstones, Inc., PO Box 272, Bottineau, ND 58318. Online giving options available at StoneBank.org. Come on Class of ’72. Let’s inspire other classes to join us in this effort. It’s been a long time since our last blog post, but we are always working behind the scenes to raise funds to get this project completed. We welcome input about foundations, nonprofits, businesses or individuals who would help us with a donation. The Historical Society of North Dakota has been a great friend of the Stone Bank Project, but it has not received funding to distribute as grants from the Legislature. Without that funding, we have to raise money from other resources. We created the Class of ’72 Challenge to ask our classmates and other classes to contribute to restoring and repurposing this charming, historic building. Come on, Class of ’72! If you haven’t contributed, please do so. If you have contributed, you can do so again or egg on a friend or relative to contribute as well. In total, we need to raise about $60,000 to raise the back of the building and put the roof on. Together, we can get this done! Zoink! It has been 45 years since the Class of ’72 graduated — and today it turns out that our class motto has stood the test of time. In fact, it seems that our motto is also the perfect slogan for the Stone Bank project. It still works! Our class motto is also a good slogan for the Stone Bank project. 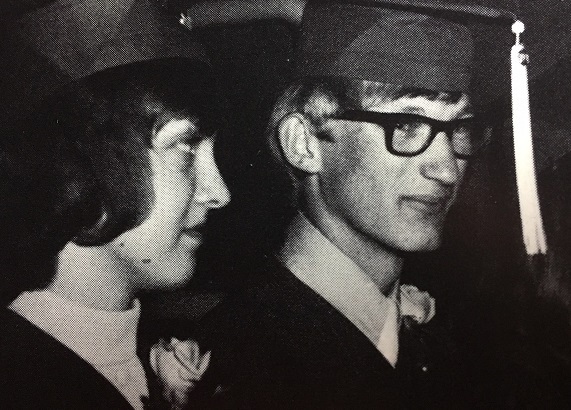 Jacalyn Larson and Leland Larshus graduated in 1972 from Bottineau High. Brian Zahn, Class of ’72, still styling in 2017. In the final days of June, we have the “soul to dare” that we can raise some matching funds to continue work on the Stone Bank this summer. We are challenging all the members of the Class of ’72 to make a donation to the Stone Bank project — to help get the back of the building enclosed this year. And we are asking all BHS grads to step up and also make a contribution in 2017, too. The budget to enclose the back of the building is roughly $54,000. We have a $20,000 grant from the Historical Society of ND that we need to match by June 30. If we don’t match the grant, we leave that money on the table. That’s why we are asking for your donations by Friday. You can give online with a credit card by using Go Fund Me. Saving historic buildings makes economic sense? Indeed, in late 2016 a team from Smart Growth American toured Bottineau and met with community leaders to discuss a vision for Bottineau’s future development. Smart Growth works with communities across the U.S. to improve everyday life with better development. After its visit to Bottineau, it offered six recommendations to help Bottineau remain a vibrant and growing community. Its #1 recommendation is to preserve Bottineau’s historic buildings. We are not crazy optimists – we are ahead of the curve! The Smart Growth report mentioned the Stone Bank project as something to invest in. Check out the details on our blog. A gift to this project will leave a lasting mark in Bottineau. The Stone Bank was built in 1900 by pioneers. We want to repair and restore it to last another century. When a lot of people give a little each, it adds up quickly. We are asking all BHS grads to have the will to do and the soul to dare to help turn the Stone Bank into a useful, restored building on Main Street. We are adding a handicap entrance at the back of the building — so it will accommodate everyone when it is complete. We haven’t been able to reach all of our Class of ’72 classmates. Bev Waters is someone we would like to reconnect with. If you’re in touch with her, please share this blog post with her. As you know, people move on. They leave ND, and we lose touch. So, help us reconnect, if you can. 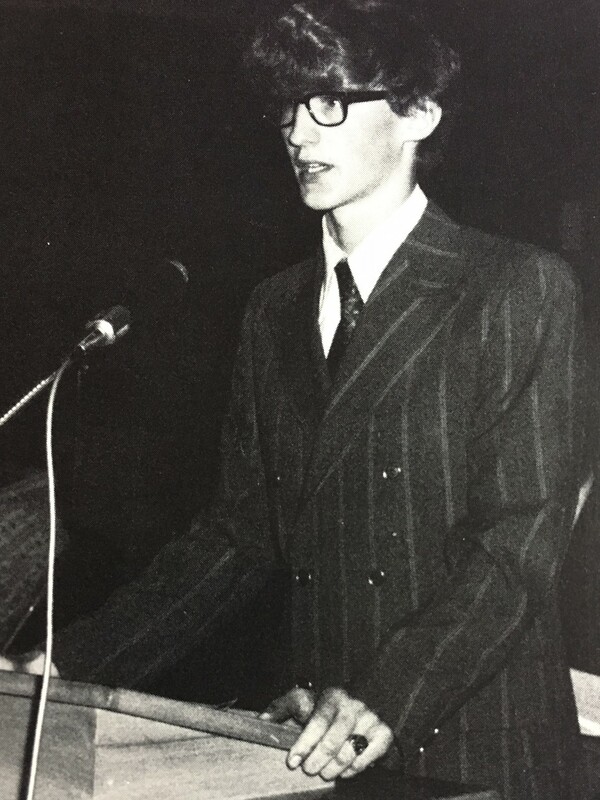 These photos are from the 1972 yearbook — which in its day broke some new ground. Let’s break some ground together in 2017 and successfully restore one of Bottineau’s coolest buildings. Please join the Class of ’72 in putting the Stone Bank back together again! Joe Whetter, center, served in the Marines after high school and he is doing the heavy lifting on the Stone Bank as our stone mason. We know that everyone from the Girl Scouts to your church asks for donations. We get it. But imagine the pride you will have in the Stone Bank when it reopens as an office, a store or a coffee shop in the next couple of years. Your gift will create a lasting legacy to future generations of Bottineau residents. Give today. Our fundraising deadline for this grant is Friday, June 30. 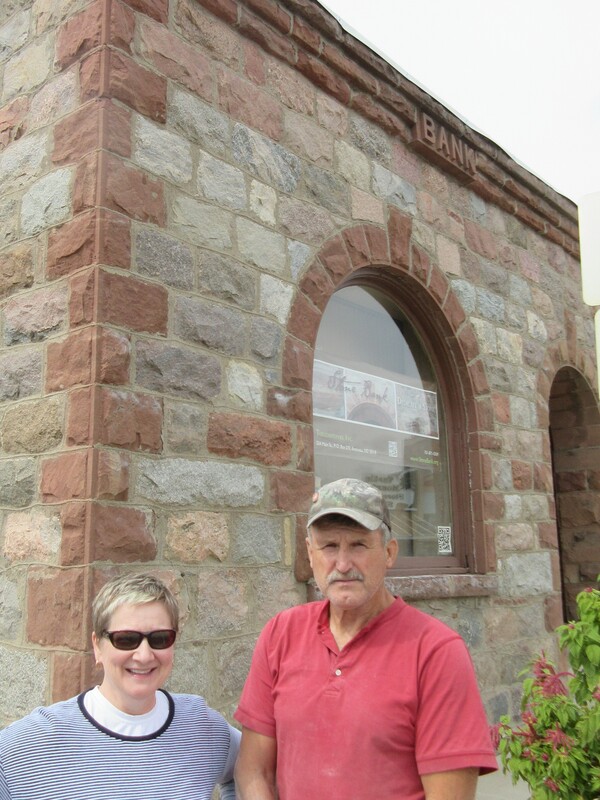 Sharon Kessler and Joe Whetter are spearheading the effort to return the Stone Bank to use. It was built in 1900 with stones carried to North Dakota by glaciers. 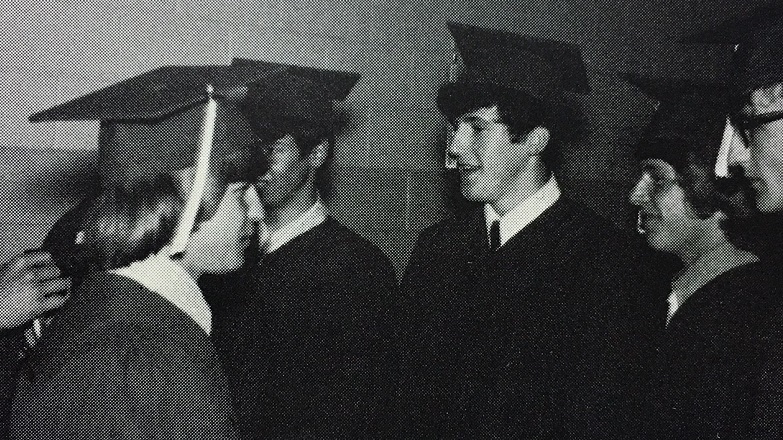 Joe Whetter and I were classmates at Bottineau High, but we didn’t know each other well. I am not sure we ever spoke in high school. 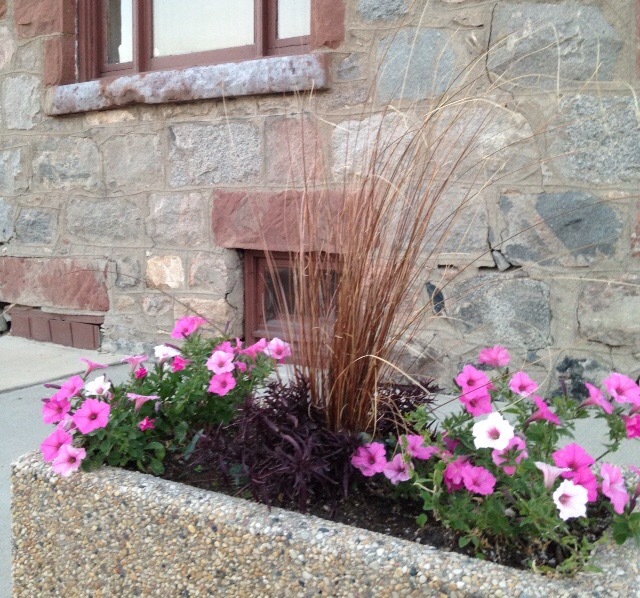 But for the past six years, we have talked a lot about and worked to restore and repurpose a beautiful stone building on Bottineau’s Main Street that we now call the Stone Bank. Joe, a stone mason, has done the heavy lifting – lending his know-how and strength to the project. Me? I write grant proposals, do fundraising and lead the board of a nonprofit dedicated to repairing the Stone Bank. Our goal is to retain the building’s historic character while making it useful for another 100 years. Since 2011, we have encountered asbestos, a very leaky roof and a crumbling back wall. Joe dismantled the back 20 feet of the building so we could put in a new foundation and rebuild the back. We have worked with architects, historians and community members to meet this challenge – and it has taken time to raise the money to help us move the project along. Fast forward to 2017. 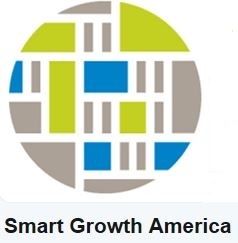 Smart Growth America, a D.C. nonprofit, says we are not crazy optimists – we are ahead of the curve! Smart Growth works across the U.S. with elected officials, real estate developers, chambers of commerce, urban and rural planners and community groups and leaders in D.C. to improve everyday life for people across the country through better development. In 2016, a Smart Growth team visited Bottineau, toured the community and surrounding area and met community leaders to help craft a vision for Bottineau’s future development. The resulting report offered six recommendations to help Bottineau remain a vibrant and growing community. The No. 1 recommendation was “restore and repurpose historic structures for community revitalization.” Read the Smart Growth report. The Smart Growth report specifically cites the Stone Bank Project and its slow progress because of “a lack of funds.” So, there you have it. A great idea. A work in progress. 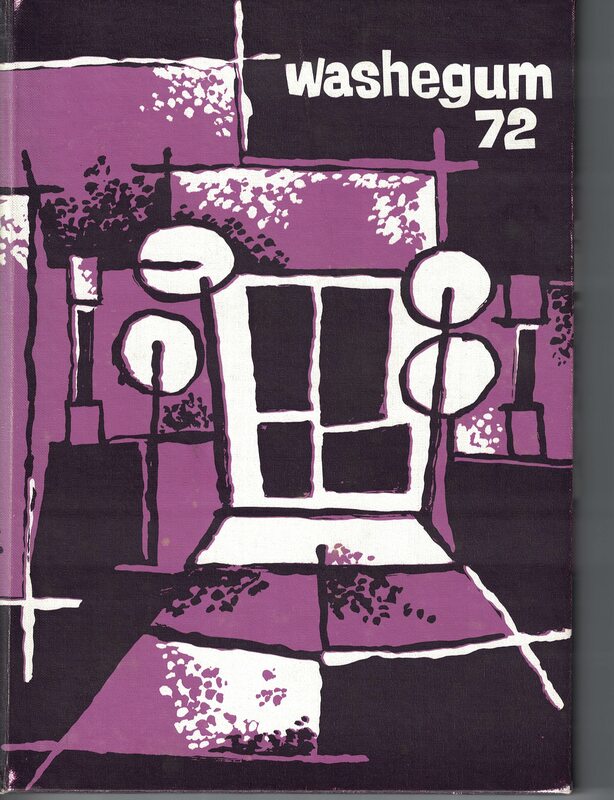 The Class of ’72 yearbook cover broke new ground with an abstract image of the Bottineau High entrance by our classmate Morris McKnight. 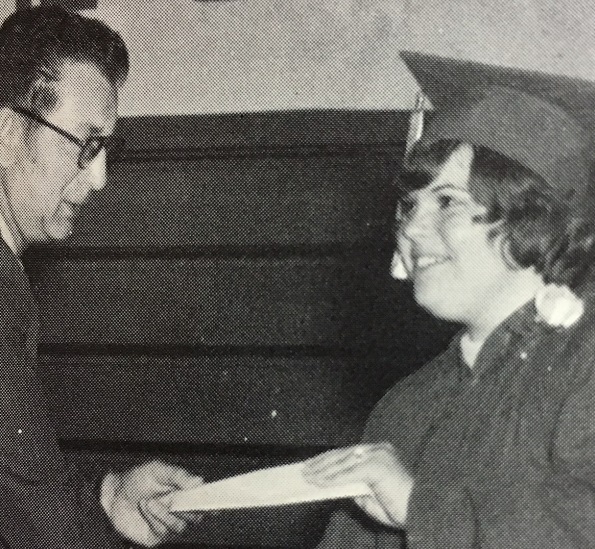 Forty-five years ago, the Class of ’72 graduated with eyes trained on the future. Now, honoring the past can be our legacy. We are asking our high school classmates to lend a hand in the Stone Bank restoration. No heavy lifting involved. We are challenging each of our classmates to contribute $100 (or whatever you can give) to help pay for enclosing the new basement. By June 30, we need to make a dollar-for-dollar match of a $20,000 grant from the Historical Society of North Dakota. If we can’t raise the match, we leave some part of the money for reconstruction on the table. And we want other BHS grads to join the effort. Let’s see which class can move the most stone. Rock on! All donations go straight to the project, and your donation will make a difference in 2017. In total, we only need to raise $53,000 (including $20k from the state) to enclose the building. Can you help? Time is of the essence if we hope to claim the full $20,000 grant from the Historical Society of ND. We have started a Go Fund Me campaign for online giving. Or you can mail a check to Touchstones.Inc. (The Stone Bank Project), PO Box 272, Bottineau, ND 58318. We also accept gifts by PayPal. Touchstones is a 501(c)(3) nonprofit – so your gift is tax deductible AND eligible for an employer match. Please, make a donation today. If you love Bottineau and its historic buildings, today is the day to show your support. Your gift WILL make a difference. Let’s face it. WE are living in historic times! It was a winter of historic snowfall in Bottineau, but our friend Spring is finally pushing the snow into memory. It’s time to seize the moment and get back to the important work of enclosing the Stone Bank. Of course, it’s always about the bottom line. That’s the challenge. And we are asking our classmates in the BHS Class of ’72 to lead the way. How? It’s easy. We are challenging each member of the Class of ’72 to donate $100 to restoring the Stone Bank. We have lost five classmates far too young, and it would be marvelous if each of us donated in memory of those friends as well. Those $100 donations would bring $7,000 to a project that really needs a financial shot in the arm. Together, we can give the project a boost and inspire giving from others with ties to Bottineau. Why the class of ’72? Good question. Well, two of your classmates have been doing the heavy lifting on this restoration project. Joe Whetter, is a stone mason and an amazing advocate and partner on this project. I (Sharon Kessler) founded a nonprofit, have coordinated fundraising and planning to advance the project since 2011. Now, we really need your help. It’s easy to give online. You can give by credit card through PayPal, Razoo or GiveMN. The time is now. We can’t do this alone. We need to make progress on the building in 2017 to keep the structure from deteriorating. It has been open to the elements for a couple of years. We need to show community participation and interest to generate grants — so your contribution really does make a difference. In total, we need to raise $58,000 to enclose the structure. Can you help? Frankly, we are at a point in life, where many of us are thinking about legacy — the difference we made in the world. The good we will leave behind. This is a great chance for you to help preserve a piece of Bottineau history and make it useful for future generations of those who will call Bottineau home. Your $100 gift added to those of other classmates really will make a difference. Please make a gift today, so we can move forward with restoring this community treasure. Let’s get this done, together. We would love to hear from you. Please send a note, your ideas and memories of Bottineau for the blog to touchstones.inc@gmail.com. Guest blog entries are also welcome. Today is Give to the Max Day, which is an initiative started by GiveMN, an offshoot of Minnesota Community Foundation. And here we are, a couple residing in Wisconsin most of the year, asking people from Minnesota and beyond to make donations to a nonprofit restoration project in remote Bottineau, North Dakota. Why, considering all of the other nonprofits with great causes closer to home, should you make a contribution to the Stone Bank Project today? Maybe because we need it more than most. Maybe because you’re a supportive friend. Or maybe because you realize that they’re not hand-building Main Street anchors out of millennial-old stone boulders anymore. If this project fails and they tear down this landmark, we all lose a part of our pioneer history that is unrecoverable, unique and yet universal. The State Historical Society of North Dakota has recognized this with a $20,000 grant to the Stone Bank Project that must be matched, dollar for dollar, by April 15. That’s where you come in. Every dollar you contribute to the Stone Bank on Give to the Max Day or any day goes directly toward matching that grant and, ultimately, paying for the $58,000 worth of work our contractors will do to enclose the back quarter of the Stone Bank building. Please include the Stone Bank in your Give to the Max contributions today and beyond. (And if the Give to the Max site is down or too slow, please use our gofundme page — or send us a good old-fashioned check, made out to our nonprofit, Touchstones, Inc., P.O. Box 272, Bottineau, ND 58318.) Thank you! We give our max to the Stone Bank Project; will you? Let’s make this short and sweeet! Today is “Give to the Max Day,” which means it’s the day when people all over the Midwest are digging deep into their heart — and budget — to donate as much as they can to the charitable causes that mean the most to them. We hope the Stone Bank Project will be one of those causes for each of you reading this. Please make a donation today on the Stone Bank Give to the Max page by clicking on the logo or this link. Not only is your deduction 100% tax deductible (because we are a 501(c)3 nonprofit organization), but 100% of it will be matched by our new $20,000 grant from the State Historical Society of North Dakota — and 100% of it will help pay for enclosure of our new Stone Bank basement before winter sets in. 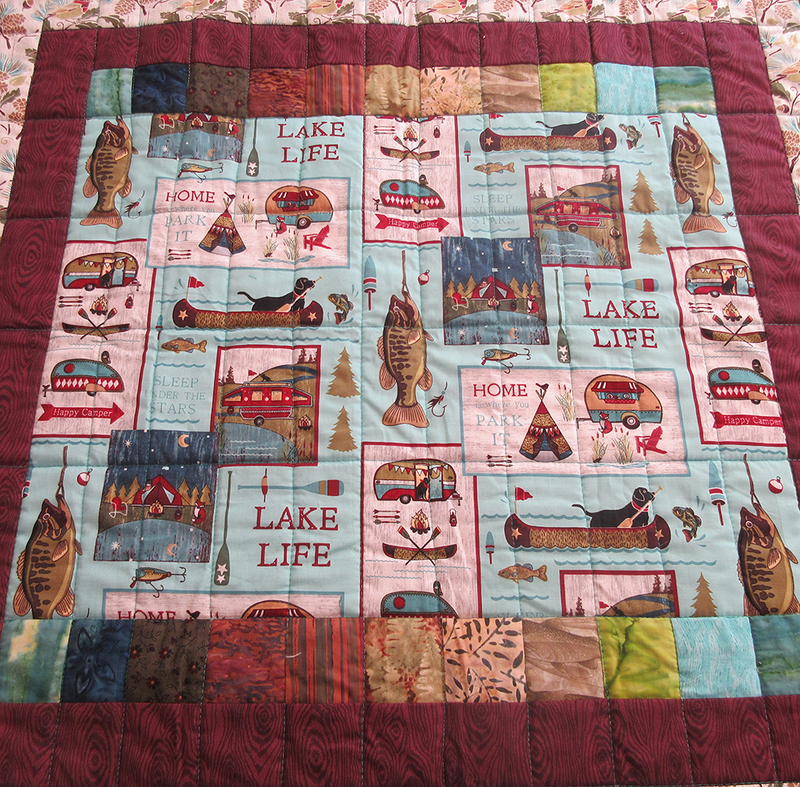 PLUS, we will enter your name in our Nov. 28 raffle for the beautiful homemade quilt you see here. Let’s hear it for the working man… and woman. We hope you are taking a break and enjoying the day. This Labor Day, we are especially grateful for our Stone Bank team. They are doing the heavy lifting to help bring this historic building back to life. They are ready to get back to work, but we need the money to pay for their time and effort. Every donation to our 501(c)(3) goes directly to materials and labor. Your donation will make a difference. Please make one today. Honor a loved one by dedicating a stone. Add to your T-shirt collection by making a $15 donation. Or just help us move the project forward with a contribution to the project. Links for online giving are in the right column, or you can mail a check to: Touchstones, P.O. Box 272, Bottineau, ND 58318. If you need a “Dedicate a Stone” form, we will send you one. We are very thankful for the resourcefulness and tenacity of our contractors. They give us a lot and we want them to enjoy the fruits of their labor. Please make a donation today to honor their work to finish enclosing the building. When the Stone Bank phone rang last week the caller ID said the caller was from Mohall. Mohall? Hmm. Could it be a generous donor who wants to help our project? Caller: Is this the Stone Bank? Caller: Do you cash checks? SB: (Thoughtful pause). Well, we take checks as contributions, but we are not a bank. We are restoring a historic bank building. Caller: So, you don’t cash checks? Caller: Do you know where I could cash a check? Well, of course, I offered a couple of suggestions. We always try to be helpful at the Stone Bank. 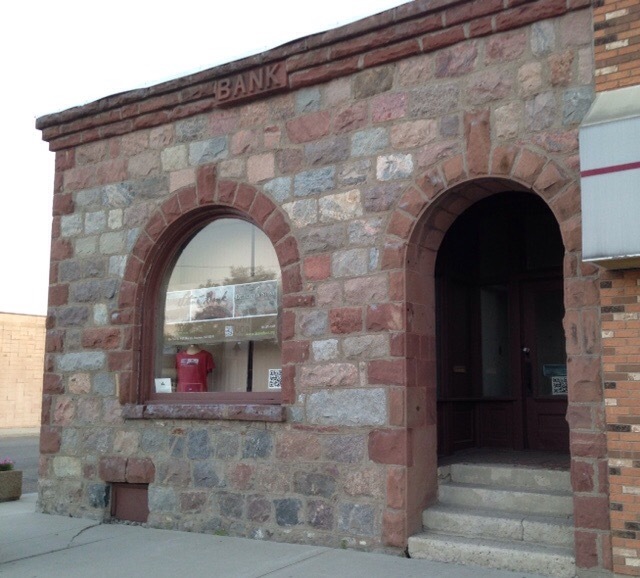 We are NOT a bank, but we are restoring Bottineau’s first bank. Now we need your help to pay our contractors and put the building back together again. We will take your check (donations only) at Touchstones, Inc., P.O. Box 272, Bottineau, ND 58318. Any amount will help. It all goes directly to the restoration project to match our grants and pay our contractors. We need to enclose the back of the building in 2015. Your gift will mean a lot and it is tax deductible. 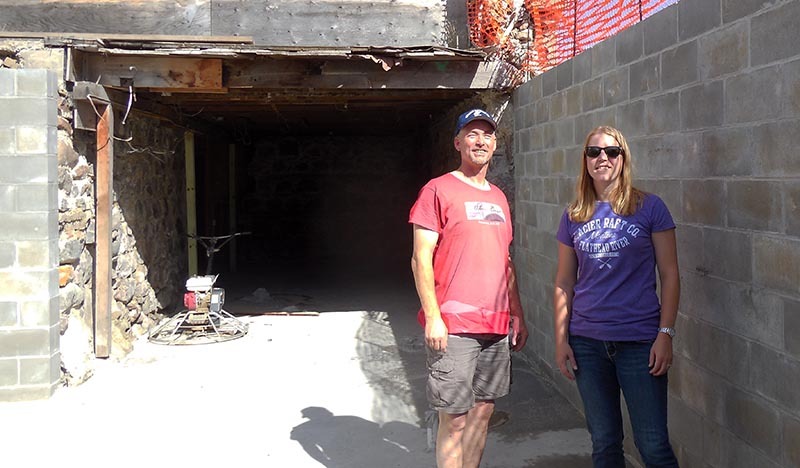 Touchstones advisory board member Mike Dorsher and State Historical Society Architectural Historian Lorna Meidinger survey the new concrete heated floor and support walls at the Stone Bank project. This year’s progress on the Stone Bank project is encouraging, and the restoration work might merit even larger matching grants in the near future, State Historical Society Architectural Historian Lorna Meidinger said today in Bottineau. Meidinger said she was happy to see that the Stone Bank project is now well into its construction phase, not just destruction any longer. She climbed down onto the basement’s new concrete floor with embedded heating coils and inspected the concrete block walls that will support the stone facade. She agreed it will be crucial to build the rest of the concrete walls and extend the new roof over the back 29 feet of the building before the snow flies this year. Meidinger also toured the interior of the original 1900 structure and agreed that it would be relatively easy to take down the partition walls and open the space for a bright and airy cafe or meeting rooms. The architectural historian gave her approval to all of the scraping, priming and painting of Stone Bank window frames that a group of 12 visiting Fulbright Scholars did last summer. “Volunteers aren’t always that careful with their work,” she said. More help could be on the way from Bismarck, Meidinger said, noting that she and others are pushing for the State Historical Society of North Dakota to raise its $20,000 ceiling for annual matching grants. The Stone Bank project has already garnered two $20,000 grants and one $15,000 grant from the SHSND, but all grants from the state must be matched with donations of money or labor from the community. Currently, the need for private donations is urgent, because if we can’t afford to finish the block walls and back roof before winter, ice will start to damage the basement walls and flooring already installed this year. So please send your tax-deductible contributions to P.O. Box 272, Bottineau, N.D. 58318 or use the PayPal or Razoo links to the right to put it on your credit card.